Smart Alarm detects your light sleep and wakes you up. It would wake you up much earlier than the time you set, but you will wake up refreshed. The healing lull sound will be played to induce peaceful sleep. (This sound will stop automatically.) Over 50 kinds of sounds are available if you post a comment or picture on SNS. Turn off the alarm when you wake up, and get your daily sleep data. You can find out your sleep quality and see the deep sleep and light sleep cycles with sleeping time. 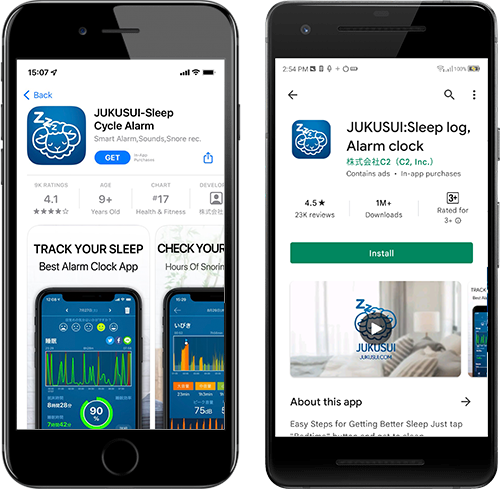 If you continue to use this app for a month, you can get your own report analyzing your sleep in various aspects. This report detects your sleeping style, and provide you with the tips to sleep better. You can keep all of your Sleep Record on the dedicated server safely. You can check your Sleep Record on your computer. Furthermore, when you change your device, you can transfer the data from your old device to the new one. 3 kinds of wake-up task, alarm sounds shuffle play, output sleep diary, and auto vibrate mode - find your favorite function! Access to the market page, and install it. Installing is free. Once you create your account, you can use the cloud service which provides automatic backups. Of course, the account creation is free. You can set the alarm as much as you like such as changing the number of snooze repetition, using the auto fade function in alarm sounds, etc. Comfortable sounds for waking-up are available for free. 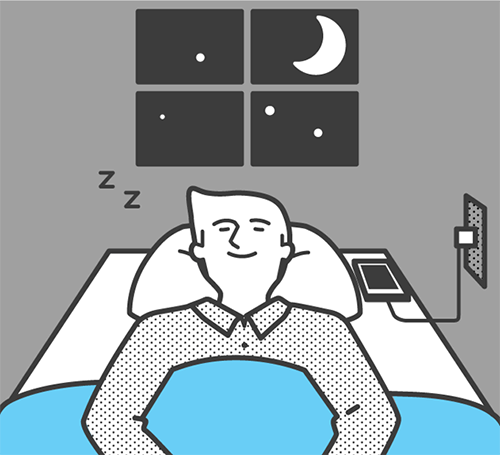 If you turn “ON” the lull sound and tap the“Bedtime” button, the original lull sound will be played and will make you sleep well. Some of the sounds are available for free. If you turn "ON" the smart alarm, the app detects your light sleep and wakes you up. The duration of light sleep that must be detected before the alarm sounds can be customized. 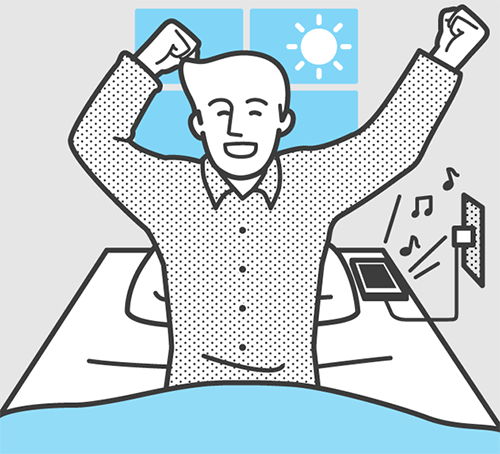 When a wake-up task is set, you have to complete the selected task to dismiss the alarm. Wake-up task provides strong support for your awakening. You can get your daily sleep data only when you turn off the alarm and wake up. Then, you can find your sleep evaluation and sleep-wake cycle. If you add the feeling when you wake up to the report, you will know your comfortable sleep pattern. 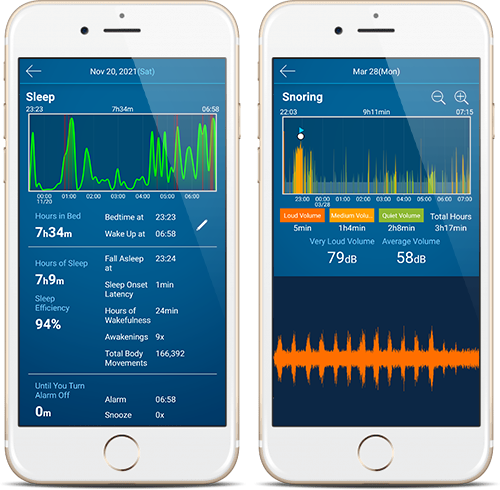 his app evaluates 6 essential elements for your sleep - bedtime rhythm, wake-up rhythm, health, beauty, light sleep, and deep sleep. It shows your sleep depth from when you go to sleep to when you wake up. Your sleeping state is known from an algorithm by a PhD in Sleep Medicine at California University. You can find summarized data for a month. It shows your sleep tendency, and you can use it to improve your sleep. 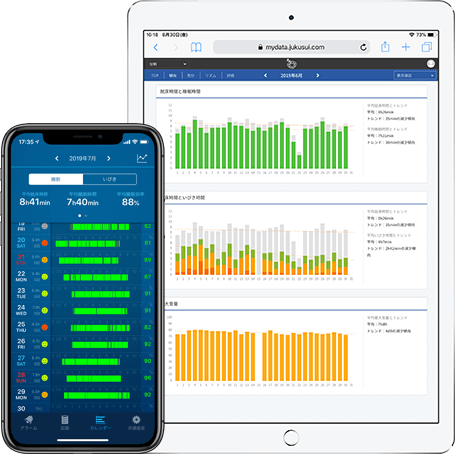 You can get your own monthly report analyzing your sleep in various aspects such as average bedtime, average wake-up time, average hours of sleep, the relationship between sleeping hours and feelings when you wake up, and frequency of snooze button use. Sleep diary including bedtime, wake-up time, hours of sleep, and number of nocturnal awakening is output in PDF format. You can show it to the doctor at the time of visit hereby outputting a sleep diary, if you go to the hospital because of sleep trouble. Sleep Smart Manager is waiting for you at the store!